Oshkosh, WI June 25, 2016 – Leading aircraft insurance broker, Aviation Insurance Resources (AIR), announced today the finalist in their inaugural “Get into the AIR” aviation scholarship. The competition was fierce but the AIR scholarship committee ultimately decided on an aircraft dispatcher that stood out from the rest of the applications, Caitlin Lyons. Filled with lofty goals, Caitlin’s determination is unmatched. 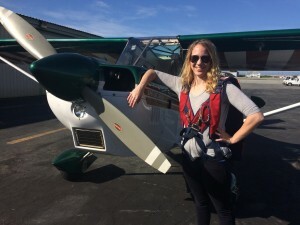 During her private pilot training, Caitlin lived in Manhattan without a car. Her commute to a general aviation airport consisted of 1 ½ hours by train followed by a three mile walk one way; all while working full time! 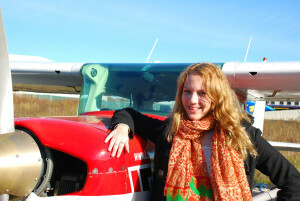 Caitlin’s career change to an aircraft dispatcher has brought her to California where she has begun advanced training. She is a member of Girls with Wings, The Ninety-Nines and Women of Aviation. In her spare time, she enjoys speaking to others about aviation, especially women and children. Caitlin will be using the $500 scholarship to kick start training for her instrument rating. She plans to complete her instrument rating, commercial rating, as well as her CFII and MEI within the next two years. You can keep up-to-date with Caitlin’s career progress on her blog at www.CessnaChick.com. PreviousPrevious post:Aviation Scholarship Deadline Fast ApproachingNextNext post:Insurance Benefits for The Cub Club members!